Finished a toy as a surprise for a friend who loves hedgehogs. This was a stealth knit until the package arrived at her house. It’s an interesting pattern, the spikes are done on larger needles, and each spike is offset from the row in front and behind it. Each row of spikes means another two ends to weave in, so I did those as I went to keep things tidy. Flapping ends annoy me. This is basically a frilled rubgy ball with eyes. Bright green eyes showed up better than black would have (and are also a hat tip to the Rise of the Planet of the Apes film). The head shape reminds me of a womble. 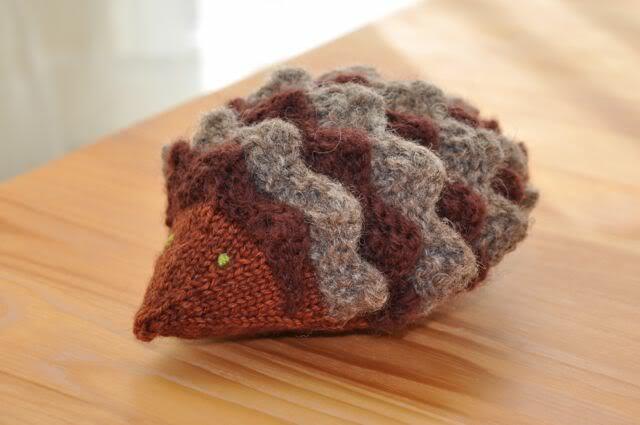 People at work identified it as a hedgehog (2), mouse (1), or an armadillo (1). I used this as an observation test, replacing one of the 3D jigsaw puzzles on my work shelf with a hedgehog to see who would notice. From the results, I think I’m safe to dye my hair bright purple, wear red contact lenses, and get about twelve more visible piercings. If you do go ahead with the personal appearance upgrade, might I recommend a tinfoil hat to complete the look?